Keyword research is the foundation of search engine optimization. It provides a window into searchers’ desires and needs. It’s a free form of user data that’s available to anyone with a little patience. Start by assembling a two-column spreadsheet. Column A lists keywords and phrases for the items your business sells. Column B lists the number of monthly searches for those words and phrases — the market demand, essentially. What you can do with the data is extraordinary. It can inform content strategies and even uncover the gaps in your natural search performance. Keyword research in its simplest form starts with a two-column spreadsheet. Column A lists keywords and phrases for the items your business sells. Column B lists the number of monthly searches. Seeds are the single-word stems of keywords. For ecommerce sites, seeds typically represent the products you sell and their attributes. For instance, if you sell wall art, keywords could be major categories such as “metal wall art” and “canvas wall art.” Seeds could include the genre (abstract, botanical, landscape), color (blue, red, green), and other attributes. Be careful to consider seeds that are synonyms of your categories and attributes. For example, some consumers may refer to canvas wall art as a painting. Seeds can be mixed in different ways — “green abstract metal wall art,” “botanical painting,” or “landscape canvas wall art.” Use Mergewords or a similar tool to stitch your seeds into phrases that searchers may use. This process can generate many thousands of potential keyword phrases. Depending on your resources, you may need to limit the number of phrases to those that are most likely to produce results. For instance, price and shipping-speed attributes rarely produce strong keyword demand. 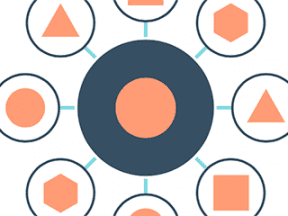 However, limiting keywords introduces your own biases because you decide which data to collect from the tool in the next step of inputting into Google Keyword Planner. Instead, merge all high-value keywords and input all of them for the strongest results. I use Google Keyword Planner to extract free keyword data. 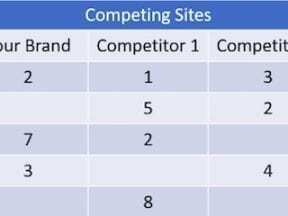 Here’s why: The core value of keyword research is the keyword paired with a number — this keyword theme, that many searches. Yes, the numbers in Keyword Planner are rounded. Some SEOs don’t trust Google to provide reliable data. And yes, the keywords are clumped into contextual themes instead of being listed individually. And at the end of the day, Google Keyword Planner is the only free tool that provides numerical data per keyword in bulk. It’s straight from the source of 90 percent of natural search traffic and revenue. If you have access to your company’s Google Ads account (formerly AdWords), you have access to search volume paired with the keywords. If not, the tool is still free, you’ll just receive ranges for the volume instead of individual numbers. 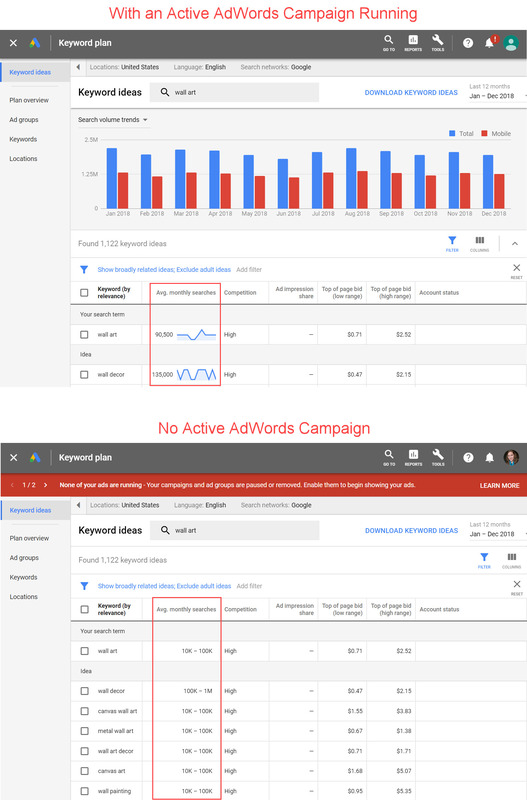 The top screenshot from Google Keyword Planner is without active AdWords campaigns. The lower screenshot shows results with active campaigns. Click image to enlarge. To use Google Keyword Planner, click “Find new keywords” and enter up to 10 keyword phrases at a time. You can also enter a URL, which is a good way to collect keyword data from competitors’ sites. Click “Get Started,” and you’ll receive keyword data. On the data results page, click on the filter in blue that says “Show broadly related ideas” and change it to “closely related.” Broad is very broad — for our example of wall art, you’ll see results such as wallpaper and paint. Choosing “closely related” should filter those less-relevant keywords out of your data set. Now click on “Download Keyword Ideas” in blue, next to the date range, to receive a CSV file of all of the data for those first 10 keyword phrases. Continue pushing phrases through the tool until you’ve exhausted your merged seed list. It will take time, probably a lot of time. But it’s worth it for data to base your SEO and content strategy on. Now you have many CSV files with keywords. You could copy and paste them together, but that would take almost as long as collecting the data. Instead, merge your files using the PC CMD prompt, or the Mac terminal prompt. There will be many duplicate keywords among the CSV files. Even though you selected the “closely related” option, some of the data won’t be relevant to your business. Next, import the combined CSV file into an Excel spreadsheet. Use Excel’s “Remove Duplicates” function to make sure that there’s only one instance of each keyword phrase in your spreadsheet. 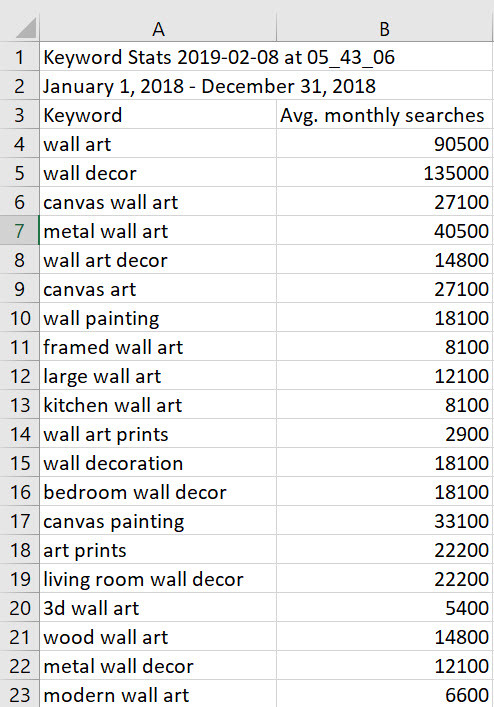 Sort your keywords by the “Avg. monthly searches” column, largest to smallest. There will likely be high-volume keywords at the top of your list that aren’t relevant. It’s important to remove those big phrases because they can wildly skew your analysis. Scan down the list to a reasonable point — maybe the top 1,000 keywords, or keywords that drive more than 1,000 visits each. It goes faster than you’d think. When you find an irrelevant word, filter the entire list by that word — maybe it’s “wallpaper” — so that you can delete all at once other phrases containing it. Next, sort your keywords alphabetically. This groups similar keywords and makes it easy to remove clumps of irrelevant ones. Scan quickly at this point. Your previous sort by keyword volume should have uncovered many of the most irrelevant phrases. Sorting alphabetically is more of a safety check. Now you have clean keyword data. Don’t lock it away in a drawer. Use it daily as a quick reference for various decisions. Share your keyword research with your team, especially those that love data or need content ideas. In my experience, most of your team will value your final analysis and suggestions, as opposed to handing them a mass of data.